You might have heard that sleeping with your head under a window is bad feng shui. But do you know why? Before I begin, let me clarify that this article is NOT about the feng shui of a bed placed under a window. Rather, it is about sleeping with your bed under a window AND with your head right under that window. “Don’t situate the bed directly under a window. The chi entering through the window will disrupt sleep.” – Feng Shui Bed Positioning. Sally Painter, Feng Shui Practitioner. “At nighttime your body needs strong support, as well as protection, in order to do its best with the work of regenerating itself. This is the reason a good solid headboard is highly recommended in feng shui. In addition to a good headboard, you always want to have a solid wall behind your bed. When you sleep under the window, your personal energy tends to get weaker in time, as it has neither proper support, nor protection.” – Feng Shui Tips and Solutions for Bed Under Window. Rodika Tchi, Feng Shui Expert. But how does the incoming chi disrupt your sleep? What does it mean by proper support or protection? How does your Chi energy fly away at night? Sleeping with your head right under the window is bad feng shui because your sleep will be disrupted by the Chi coming from the outside, which includes smell, sound, and others. You will get less quality sleep at night, and your energy level during the day will be weaker as a result. As for support and protection, think of it as the sense of security we need in order to relax and rest. Here are four reasons why it is bad feng shui if you sleep with your head right under a window, along with some remedies to mitigate its negative effects. When sound becomes noise, it becomes a negative Qi that not only disrupts your sleep cycle, but also arouses anger (in my case), frustration, stress, and other negative emotions. You may be quite familiar with how noise affects your sleep. However, you may not be aware of how sound travels. If you live right next to a busy street, here’s a simple experiment that you can do right away to find out. Go to a room with a window that is faced towards the street. With the window open, observe how much sound or noise you can hear that are coming from the outside. Then go to other areas in the room and observe again. You will notice that the sound is most concentrated if you’re standing straight from the window. Noise is loudest when you stand straight from the window. This is because the window, similar to your front door, is a gateway of the incoming Qi from the outside. Once the sound gets inside the room, it will disperse and get absorbed by your furniture, blankets, etc. This simply means that the noise level are most concentrated right next to the window. At other areas of the room, the noise level won’t be as bad. With your head right under the window, the sound you hear may be no different than if you’re right outside the window. How do you think that would affect your mood and sleep? Studies have shown that sound as faint as whispers can arouse our brain activities even when we’re sound asleep, and it is these brain activities that cause us to get less quality sleep. Other studies have shown that exposure to sound causes shifts from deeper sleep stages to lighter ones. An easy feng shui solution is to close your window when you go to bed. 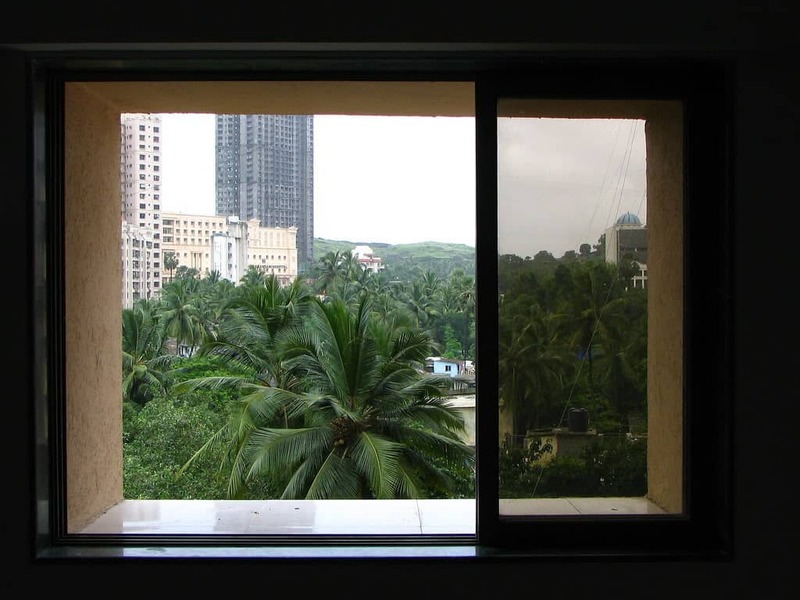 If you live in a noisy neighborhood or in the middle of a busy street, you can install windows with double-paned glass for better noise reduction. The quicker and more economical alternative is to use earplugs, although it could bring you other types of discomfort. If you live in the city center and depending on the wind’s direction, you may sometimes smell the car exhaustion coming from the streets. Or, god-forbid, you may smell cigarette smoke when your next-door neighbor is smoking on their balcony. 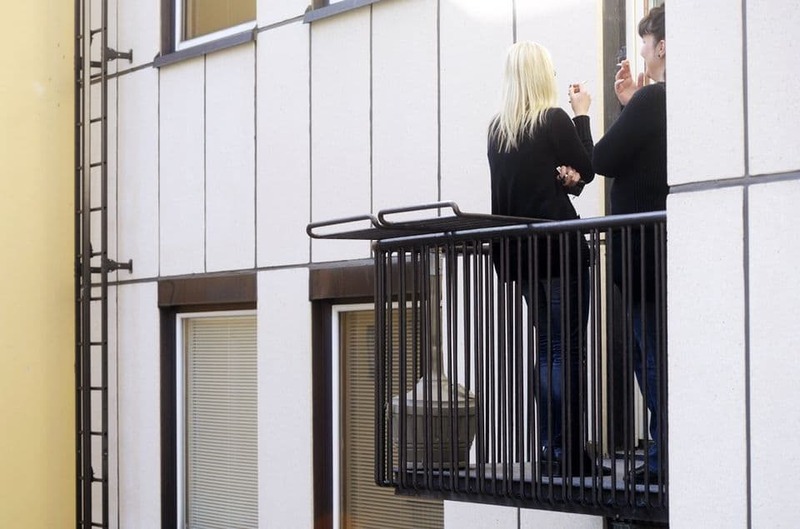 How would you feel if someone’s smoking right outside your bedroom window? How would you feel if you wake up in the middle of the night from the smell of car exhaust or cigarettes? Angry? Frustrated? And would you have trouble getting back to sleep? Just like sound, scent from the outside is most concentrated when you’re next to the window. After it enters, it gets dispersed and diluted by the existing air in the room. So if you’re sleeping with your head right next to the window, you will get the strongest smell from the outside, whatever it may be. But air quality is only one element that the air brings. Again, the easy feng shui solution is to close the window when you go to sleep. You may also want to make sure that the window is sealed tight so no air could go through. Even if you have blinds or curtains installed, some rays of light can still manage to shine through the cracks or through the edges of the curtain. Sunrise shining through the curtains. This means that when you’re asleep with your head right under the window, sunlight can be shining onto your eyelids and into your eyes. You may find yourself waking up early in the morning (which is not a bad thing) and difficulty going back to sleep. This is because light has the ability to influence our internal clock through the retina of our eyes. “Light exposure can cause our biological clock to advance or delay, which affects our sleep and wake cycle.” Source: Harvard University. Although waking up early is a good habit, sleeping with your head right under a window can also delay your sleep schedule. When energy-saving LED lights were installed in Brooklyn, New York, residents were complaining about light pollution and how it was causing sleep deprivation and exhaustion because of its brightness. One reason is that the LED lights were blue, which is known for having detrimental effects on sleep, according to Dr. Mercola. Also, with enough light intensity, simply closing your eyes is not enough, simply because light can penetrate your eyelids. 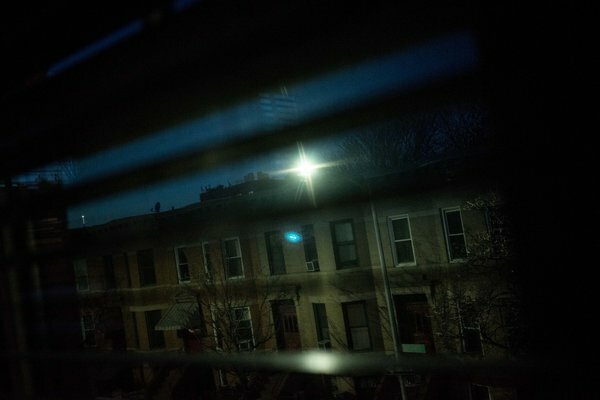 The view from a bedroom in Christopher Stoddard’s home in Windsor Terrace, with a glaring streetlight that shines into the room and makes it hard to sleep. Credit: Andrew Renneisen from The New York Times. Although you may end up forming a good habit of waking up early, you may also find yourself having trouble falling asleep at night. The after-effect is fatigue and sleep deprivation, which can cause more mood swings and low work performance, among many other undesirable effects. Instead of investing in better blinds or double-layered curtains, you can try putting on sleeping eye masks when going to bed. Make sure that the eye mask is thick enough to block out all light when you go to bed. The noise and light mentioned earlier has other potential ways of disrupting your sleep cycle. How would you feel when you wake up from an unfamiliar noise right outside of your window? What about seeing (or feeling) moving shadows created by streetlights in the middle of the night? 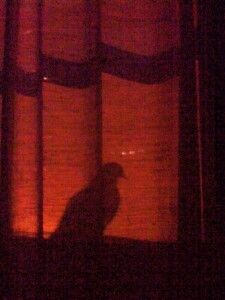 A pigeon’s movement and shadow can raise your alertness and prevent you from sleeping. Credit: NYC Wildlife. When you sleep with your head right under the window, you may easily feel or sense movements from the outside. This may include the rumbling of automobiles, trains, passer-by’s, or animal movements, including pigeons landing right outside your window (if you live in the cities) and raccoons rustling through the grass or bushes (if you live in the suburbs). These types of movements right next to your head will alert your survival instincts and raise your anxiety level, both of which can rouse you from your sleep. This is what was meant by lacking proper support in terms of feng shui, because a headboard or a wall can remedy this effect. Although you may get used-to certain types of noise and lights, such as those from drive-by vehicles, unfamiliar noise or shadow movements can alarm or even scare you. You may experience a surge in energy due to rising levels of adrenaline, thus making it hard to go back to sleep. For others, it may bring insecurity, tension, and anxiety. If you find yourself not being able to relax, you can install heavy blinds or use a thick and tall headboard that blocks off the window. But again, the best cure is to move your bed’s head away from the window. When you sleep with your head right under a window, your sleep quality will be affected by the sound, smell, light, and air from the outside of your house. What comes after a lack of sleep can impact not only your health, but also your level of focus, patience, and emotions, all of which can influence your work performance and social relationships. The best way to cure this bad feng shui is to reposition your bed away from the window. If you cannot, you will need to follow the tips provided earlier, such as using ear plugs, eye masks, and closing the window. Or if you’re looking for other feng shui tips to get better sleep, you may find this article helpful: 33 Bedroom Feng Shui Tips to Improve Your Sleep. Do you have any experience sleeping with your head right under a window? How was your sleep quality? Leave a comment below and let me know! My bed is under a window, and it’s very low down. I guess it’s still kind of like a wall/support? Yes, kind of. 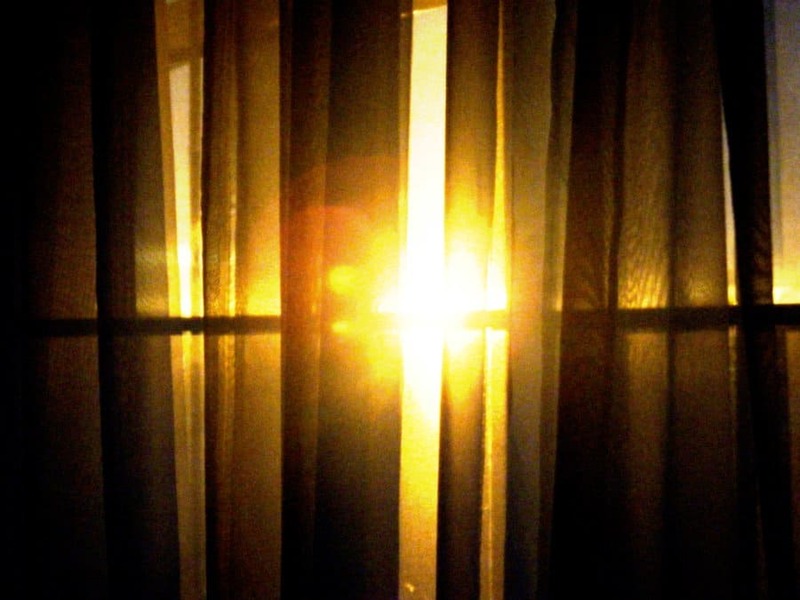 Though the sound may not be as bad, light is more likely to shine through the bottom of your curtain. Tks Victor Cheung for sharing. Since my younger days my mum advised us not to sleep directly under a window due to evil spirits might enter our body during our sleep. I understand it better after reading your blog. Very precise. Thank you. The energy behind the window will not provide good and calm sleep,this energy is very active,that’s why.. Interesting article and all very valid reasons why yang is not as good as yin spaces for a restful sleep. However, in Feng Shui the reason is because a window is an “ice mountain”. A mountain that yin qi has a hard time “climing”. Therefore the qi coming from that mountain will not be as strong as it can be on a solid outside wall. When we sleep we need to recharge our bodies and it is best to be sleeping on a solid wall that has the qi type we need to give us good character and to support our health. Flying Stars helps with determining what mountain qi type you are sleeping with. Thanks everyone for sharing your thoughts, knowledge, and experiences! Much appreciated! under window might be a lot wind blowing will cause headaches. my bed is infront of the window, is it ok? Hey nene. As long as you’re not bothered by the smell, scent, noise, wind, and movements from the outside, you should be fine for the short-term. I recently moved in this house already furnished,.the bed positioned right under the window.I am kind of energetic and positive but I noticed in few weeks time I was getting a bit sluggish and lacking some stamina I could say.Not more than one month sleeping under the window I started having head aches and facial pains .Both my partener and I had the same feeling and pains around the jaws and face.I changed today the position of the bed and had a thought to search about the bestposition of the bed in the room and I discovered your article Victor.Thanks a lot .It makes sense .I have a question .What is Feng shui?i never heard about it. It’s respecting/using our environment to better ourselves. In its oldest form, it was used for city selection and places of settlement. Now it’s been used so we can fully enjoy our living space so we can reach our goals/potential. thanks victor .will checkit out.one more question.is it bad to sleep with a fan on ?I never been able to fall asleep with it on .My partner seems to be ok with it sleeping well while I am having nightmares? This depends on the person. Some people are sensitive to the wind, while others are sensitive to the noise. It’s likely one or the other that’s bothering you. Yep, shutting window with blind down can do the job! Have recently changed my bed round have been having restless nights just wanted a change it is directly under a skylight window am in the article room …do you recommend sleeping with your head in a certain direction eg headboard North or south…great interesting article!! Your restless nights might result from the light from the skylight window. I’m guessing you’re looking up and wondering/thinking about stuff? the share via other websites web element on the left side of the page really blocks the article. I have seen this on a lot of sites lately and it is not just you, but I thought you would like to know. I took a screen shot but there doesn’t seem to be a way to post it. The element is about 1/2 inch wide and blocks your text. It is centered in the page so as to be as annoying as possible. Thanks! Thanks for letting me know. Very much appreciated. This does happen when I shrink the browser into a smaller size. I’m guessing your browser view is zoomed in more than 100%? Anyways, I appreciate you telling me this. Thanks! Hi im cherrie from philippines.can i ask for your help to feng shui my new apartment.can i send you an email and picture of my apartment. Sure send it over. I can answer simple questions but I don’t do full consultations for free. Hi I am Sheetal, I have no option then putting my mattress near the window as I cant put my bed in North, South is the wardrobe, West is the balcony with French window of full wall size and east if I put the bed it will be parallel to the bedroom door which is again bad. So we plan to pull the mattress at nite towards the west that is near the balcony ( again bad) so that while sleeping it’s away from the door. any other solution? Seems like placing the mattress near the window is the best option here. If the window isn’t right next to your head when you sleep, you’re fine. Even if the window is next to your head, all you have to do is place heavy blinds or keep the windows closed when you sleep. Our bedroom has very limited options to place the bed. 2 walls with windows and bed would be right underneath. Could a very tall solid headboard help? The other wall would position the bed in plain view from the door overlooking the bed. Looking for a long term solution? Another option is a guest bedroom but the bedroom door would be on the same wall as the headboard. Yes, a tall solid headboard will help. I would go for that option. I’m in the same boat– the only place where it makes sense/looks right with the proportion of the window to put my bed is right under the window. The room is huge and I can still play around with placement but it would take up more room if I moved it elsewhere. I’ve been at this new place for 2 and half months, and I slept really well the first month. However, I’ve been having a lot trouble sleeping throughout the night lately. It’s not abnormal but it’s been for no reason lately. If you can play around with placement, then definitely do so. If you ask me, the bedroom is really for sleep, so I would sacrifice space for the sake of sleep. Not having enough sleep is detrimental to health and can even affect your concentration and work performance! Please do note that other non-Feng Shui factors can affect your sleep, such as stress levels or eating habits. Take care! Thank you Victor. 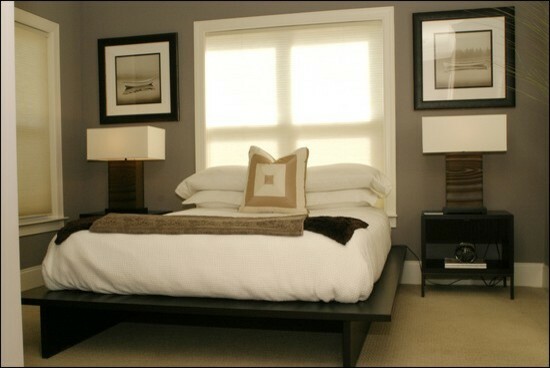 I love the location of the bedroom and “feel” good in the location. Will get the tall solid headboard. Your blog is great. Again thank you for the fast response. Hello Victor! I was wondering if you can help me with my bed arrangement. When you enter my room, the door is in the left side. The front the right wall has huge windows and the last wall is the closet. Does that only leave me with the left wall to place my bed? I heard the door should not open to your bed. Please advise! Thank you! Yes, the door should not open to your bed. It’ll be ok if you sleep right under the window, as long as your head is not right under it. Do see if that affects your sleep. What about the bed is under a long fixed glass window (window cannot be opened, just for the light to enter). The bed has a solid headboard. The long fixed glass window (width is 40cm & length 3meter) is located 1.7meter above my head when I’m sleeping. Is this considered bad? Thanks. I’m assuming you also have a shade/blind to cover the window? If so, you’ll be fine! Hi Victor. Thank you for this article. I am limited in where I can position my bed. I do have a tall, solid, wooden headboard, and am choosing to place it under a window facing the brick wall of my next door neighbor. Not ideal, but ideal in my situation I guess. You can argue for or against just about anything with this so-called science. Your wall could be close to the door which is closer to the kitchen meaning the smell of the food your teenager makes at 2 AM will reach you faster if you place your bed there. The sun can come through the window directly into your eyes when you’re on your side in your bed situated on the wall (as I have experienced) – it will never do so if your bed is against the window and you’re looking away from it (unless you live at the equator and the sun is directly overhead). Outside walls are noisier than windows when there are 40 foot trees with dozens of birds in them on the other side. In today’s modern homes, ‘ancient science’ no longer applies in most cases. Any major health effects blamed on your bed positioning is nothing more than superstition. The situations you described are completely accurate. This ‘ancient science’ is just experience that’s passed down for better sleep which can be avoided by other ways of bed placement. Thanks for your input!